In the days following Hurricane Harvey, an overflow of support from many individuals and companies has come to Texas’ aid, after what has been named the worst disaster in Texas history. One of the organizations currently assisting victims of Hurricane Harvey is the American Logistics Aid Network (ALAN), which was formed to provide humanitarian relief after the devastation of Hurricane Katrina in 2004. Those seeking to procure humanitarian services in the form of transportation, local warehouse space, material handling equipment, and other essentials are able to request these needs through the web portal, which is also a clearinghouse for those goods and amenities. 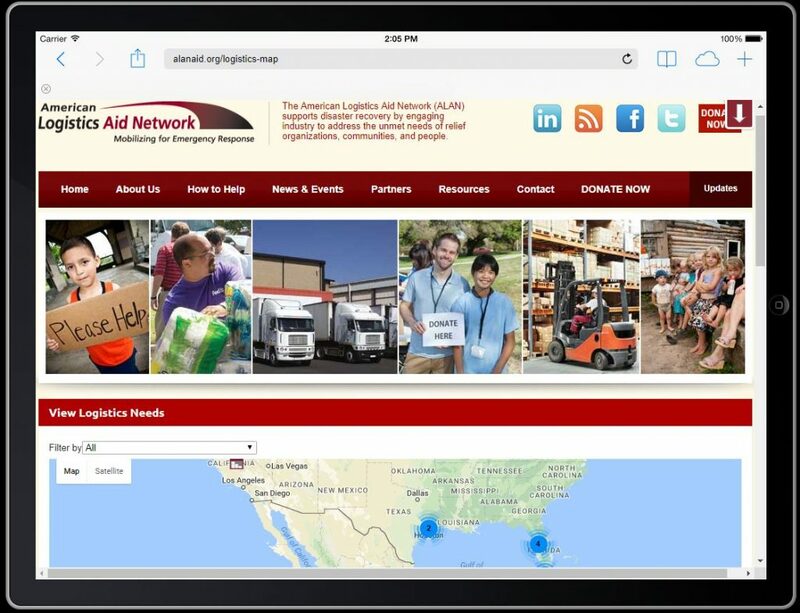 ALAN responds to specific on-ground requests made through the web portal, and provides for those specific requests in a wide variety of ways—such as offering warehouse and office space, providing forklifts and pallet jacks for tornado salvaging, offering transportation to help areas recover from flooding, and many other humanitarian efforts. ALAN takes pride in their ability to directly help individuals in need on the ground, and specifically targeting those needs, which helps to eliminate wasted resources and efforts. ALAN partners with supply chain providers, allowing those providers to specifically help with disaster relief based on their business capabilities and best interests. Overall, ALAN combines the efforts of volunteer groups, business capabilities, and disaster relief support, helping to pair not-for-profit establishments with both public and private sectors, saving money by reducing waste, and communicating needs to possible partners. Currently, disaster relief efforts for Hurricane Harvey and Irma include a need for equipment—pallet jacks, forklifts, boxes, pallets and conveyors. Dry van trucking services, box trucks with lift gate, refrigerated trailers, and flatbed transportation is needed to transport supplies. Warehouse space and cross-dock services are also needed. Evans is proud to sponsor ALAN’s great work in humanitarian aid and disaster relief. Delivering support, where it is most necessary, helps to build partnerships with organizations that will assist with emergencies for years to come. What is EDI (Electronic Data Interchange) and ASN (Advanced Shipping Notification)? How does e-commerce affect warehousing?